Manufacturers who do care for the Planet are proud to show it. When you buy new equipment or technical clothing, look for information about the materials, production, recycling, etc. Look for ethically harvested down, jackets made (partially or entirely) of recycled plastic bottles and similar products, certifications of clean production or other measures minimizing pollution, wasting, harmful chemicals in their products, etc. The additional part of being eco-conscious is also the ethics of producing the products - including both treatment of animals as well as human employers. Below you can see examples of certificates you can find on many products and gear. bluesign® - When you see clothing with this sign, you know that every step of the production was careful, so no harmful chemicals were used. The experts control, audit, and teach manufacturers so they can produce their stuff with less impact on the environment by better efficiency in using resources, minimizing the use of dangerous chemicals - which also takes care of employers, and strictly controlling pollution - air and water emissions. Responsible Down Standard (RDS) - there is a reason why there is such a discrepancy in price among various down products. Don't trust the surprisingly cheap jackets or sleeping bags - the down is probably of lousy quality, but also - it might have been harvested in an inhumane way causing suffering to animals. It's better to look for such certificates, save a bit or buy used - but know your down is not a product of force-feeding or live-plucking. In the world of Outdoor gear we have a good choice of RDS certified merchants. We can safely buy down products from such companies, as Bergans, Berghaus, Black Diamond, Therm-a-rest, Columbia, Rab, Deuter, Feathered Friends, Haglofs, Mammut, Marmot, Montane, Mountain Hardwear, The North Face or Sea to Summit. See the full list of RDS certified merchants to check if your favorite brand is on the list! Responsible Wool Standards (RWS) - when you see this certificate you know the sheep which gave you their wool was treated well, didn't suffer in any way and their farming was up to highest standards in ethics and ecology. Among companies who respect all the high-standards of RWS are: Kathmandu, Patagonia, Norrona or REI. 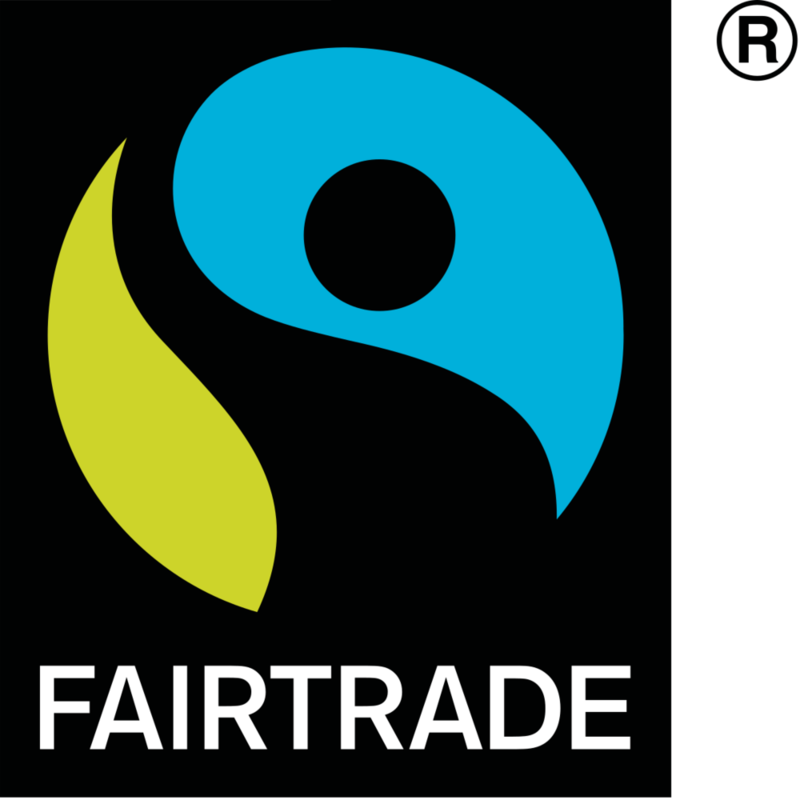 Fair Trade Certificate - you can see this logo on many products, from chocolate and coffee to t-shirts. When you see this logo, you know that people who created your apparel were paid well, worked in good conditions and were not abused in any way. Additionally, there is a lot of effort made to support their communities by building schools or medical centers. The Outdoor brands who are proud to be bluesign® partners are, for example: Arc’teryx, Berghaus, Columbia, Deuter, Haglöfs, Helly Hansen, La Sportiva, Mammut, Marmot, Mountain Hardwear, Norrøna, Patagonia, REI, Salomon, The North Face, and many more. To see the full list click on this link. As you can see the best in the Outdoors industry do their best to protect the environment. There are also other companies who might use bluesign® certified fabrics like Polartec, Schoeller, Pontetorto, 3M insulate, and Allied Down but they don’t have the full certification for the whole chain of production. Although I am guilty of it as well, we really do not need all the new, shiny stuff with each new season. We can keep on using gear that might have a few years on it but still works fine. We can try to repair and fix whatever can be fixed. We can also buy some things used or exchange it with other hikers. Some things might perfectly fine, but just don’t work for a person. They might work great for another. Three different years, same merino Devold shirt I bought second-hand. Pants on the first and second pictures were also bought used online. I also keep on using the same backpack - it’s good, so why buying a new one? I often buy clothing used as that’s an easy and pretty low-risk solution. I got a few ill-fitting pants, but still, it’s worth looking around. High-end technical gear can serve for years if you take good care of it! I have some merino tops which are crazy expensive when new, I got them used online, and I keep on using them – for over three years now, and they still look great. Just recently I scored second-hand down jacket by Mountain Hardwear. It seems new, and it would be such a loss if it ended on a land field! If you have a small tear on your jacket – just fix it with a patch. No one cares what your coat looks like in the Wild – as long as it works well, use it, patches and all. I have one jacket which I fixed with glue - it broke along the stitches. It doesn't look pretty, but it definitely seems badass, war wounds and all. This way you can keep on using them for long years, minimizing the number of things you need to replace. It’s worth investing in designated cleaning products for that particular kind of fabric. This way you won’t damage it with harsh detergents. You can renew the DWR layer, refresh Gore-tex, add some life to your leather boots, make your down sleeping bag like new, and so on. When you return from your trip, clean and dry everything. Tents tend to be pretty expensive, so you wouldn’t want to discover on the first night of your next hike that you let it get all moldy, right? Same with things like water bladder, filters, bottles, sleeping mat, sleeping bag, and so on. Check them out when you are back home – clean what needs cleaning, dry well everything and store them in the way they need. Remember that down can’t be squeezed during storage. You can either hang it in a closet or store it in a big, well-ventilated bag. A big pillow cover works great for it. Before you buy any new gear, it's worth reading reports and reviews to see what other hikers reported on its durability. Eco-Conscious on the Trail: Minimize the number of single-use things. Instead of buying new water bottles in every village you pass (and throwing away the used ones), refill the bottle you have. You can buy a hard plastic bottle which is heavier but will serve you for years. You can also buy a water bladder, which is light and too long-lived. Another must-have is a water filtration system. This, again, eliminates the need for buying one-use water bottles. Additionally, it can save you out in the Wilderness. No one wants a parasite as a souvenir, right? Take a hard look at your toiletries. It’s hard to eliminate single-use things completely (I love the convenience of wild wipes – but at least I buy the biodegradable ones) but try whenever possible. Instead of buying travel-sized shampoo and soap, buy a small bottle you can refill multiple times and simply use things you use at home. Alternatively, you can also buy the all-in-one type of biodegradable cosmetics created for Wilderness. Although they are not multi-use, they cut on the number of different bottles. You have one that serves as shampoo, soap, and dish soap. It's also better to have a cloth for washing yourself. I have a small fast-drying towel I use for that. When I have the chance - I make a "sponge bath" with my small cloth instead of wet wipes. Another helpful thing to have a tiny packable backpack. It’s quite natural, that when we camp somewhere it’s hard to go and do shopping with our big backpack. So we might end up with another plastic bag. We can of course use it to bag garbage but we can also pack it all into a small backpack. It’s also useful to have for flights, bus rides or a trip to the campsite’s washing facilities. Some of them can double as dry bags for your clothes. A while ago I watched a YT video made by a thru-hiker who explained how to cut on weight. One thing that was suggested was that instead of carrying a nail clipper all the way, it'd be better to buy a new one each time one is in town because they were so cheap, and just throw it away after use. I was shocked to read it. Metal nail clipper is not a single-use item! How many of them a hiker would buy over the months it takes to complete AT or PCT? And all for saving a few ounces? That kind of selfish thinking is part of the ecological disaster we are in now. Cleaning your dishes with soap is rarely necessary. I’m glad I grew up in scouts (literally - my Mom was a scoutmaster, my first scout camp was at 6 months old), so for me, it’s a no-brainer that you use sand and dirt to clean pots. Might sound counter intuitive but works like a charm. Grab some mud or grass mixed with wet sand, and all grease disappears. Dump the dirt away from water. Rinse in water only when you see that there is no food/oil left. Read the basics and details of Leave No Trace code - many of the things I write here are details of the main principles. In addition to the basics, it’s worth learning a bit more about the dos and don’ts of hiking and camping - to make the experiences pleasant for everyone. Hiking requires being humble - although I do believe we all have the right to be in the Outdoors, it does not mean we can do it on our own selfish terms. We are guests out there - and we must follow the rules of the place. If a region is off limits to protect its delicate flora and fauna - we can’t go there because of misunderstood entitlement to Nature. It’s important to accept that we will never see, experience or admire everything we would love to. Some places will stay as dream destinations. Thanks to beautiful Nature documentaries we can see what’s off-limits in a safe (for the environment) way. Let’s respect it and be happy with where we can go - it’s still quite a lot and for a few lifetimes. You don’t have to use open fire at all when in the Wild. Really. I explained all the details of (and reasons for) going fireless in this article. In short: it creates the risk of wildfires, causes long-lasting damage, releases dangerous toxic particles into the air, causes damage to the ecosystem, and other that it’s cool to sit around it, doesn’t win in the quest for warmth, light and food preparation with other gear. I highly recommend reading the article if you find it weird to even consider camping without a lovely fire going. To minimize the risks it’s good to use a camping stove with easy to control fire. You use only what you need to boil water and prepare your meal - and nothing more. High-quality stoves will serve you for many years. As part of the Leave No Trace rules, we need to do whatever we can to not cause (further) erosion to the trails we hike on or to create any damage where we walk or camp. It requires careful planning, staying on the trail, knowing how to find an excellent wild camp spot (where it’s legally allowed), etc. There is absolutely no reason to alter the environment to suit our needs. It’s our job to work with what we find and leave it the way we saw it. Don’t take souvenirs, don’t cut trees, don’t dig trenches or anything of that kind. To help navigate difficult spots (like muddy puddles) it’s worth grabbing a pair of trekking poles. This way you may safely walk through and stay on trail, instead of creating a new path through the neighboring woods. Whatever we brought in, we take out. No exceptions. We can’t throw away even things that are an organic waste – no apple cores, banana pills, pieces of bread – nothing. It’s not just that it looks horrible and people who do it are jerks. The consequences of such behavior are much more sinister. They might introduce foreign species (bacteria, parasites, plants) to the ecosystem, they take years to decompose fully, and they might teach animals to get close to tourists for food. To help yourself, create as little rubbish as possible. Limit the number of single-meal bags if you can. For example, I have separate pockets of soup – I can do nothing about it, that’s how I bought it, and the powder is very fine, it would be difficult to keep it all clean. But my breakfast (oatmeal) is all in one (or two for longer trips) big bags, and I merely spoon out whatever I need. Same with coffee and home-made trail mix (I take a handful from the primary container to a smaller bag each day). You don’t need to have each and every meal in its own separate plastic bag. It’s wasteful, and it also takes more space in your backpack. Below you can see my food and cooking gear set up when I was going to Norway. Top right are two bags of rice noodles - I run out of it and had to resupply. Other than that, this is basically all the food needed for 3 weeks of hiking. At the bottom is my coffee and tea setup. If you would like to learn more about my cooking gear - read this article. I know it’s still a lot of zip-lock bags, and I hope to find a better solution in the future. I’ve heard of reusable silicon bags that could replace them. Some of it can be also stored in a light dry bags - they can be washed after the trip and serve for a long time. Don’t take stuff which packages will smell or leak. So no cans of fish in oil, puddings with sweet sauces (ok, this one is from experience), soft cheeses, etc. Take special care if it’s warm out there. You might want to have a separate bag for sanitary things like used menstrual pads, wet wipes, etc. It doesn’t matter that the wild animals leave their droppings wherever they want and it’s ok. Our feces are different on so many levels that it shouldn’t be even something that needs pointing out. We need to dig a cat hole and cover it all well with soil. Check out the regulation of your destination – some Nature Reserves might have unique rules, so make sure you are prepared to bag your feces in a bag, for example. If you are not ready for it – you just choose a different destination. Some parks accept burying your dirty toilet paper, some prohibit it. Another important thing is to remember to relieve yourself away from any water source. Overtourism is mostly a problem with the more traditional way of traveling. We all have read the drama of people who live in Barcelona, Venice or Bali. Crowds, dirt, garbage, large cruisers, pollution, damages to the local economy, house markets... adding to it the crime, human-trafficking or drug consumption we have a horrible mess to deal with. We could think that hiking is free of the problem of over touring, right? Not so fast. Just because we don't use cars, cruisers or don't participate in illegal activities, does not mean we don't add to the problem. We all know that there are hiking destinations that are crazy popular. With the growth of social media and geotagging, many people choose to go to the same beautiful spots they saw online. I live in Poland, where the most popular places are near Zakopane, called the "mountain capital of Poland." 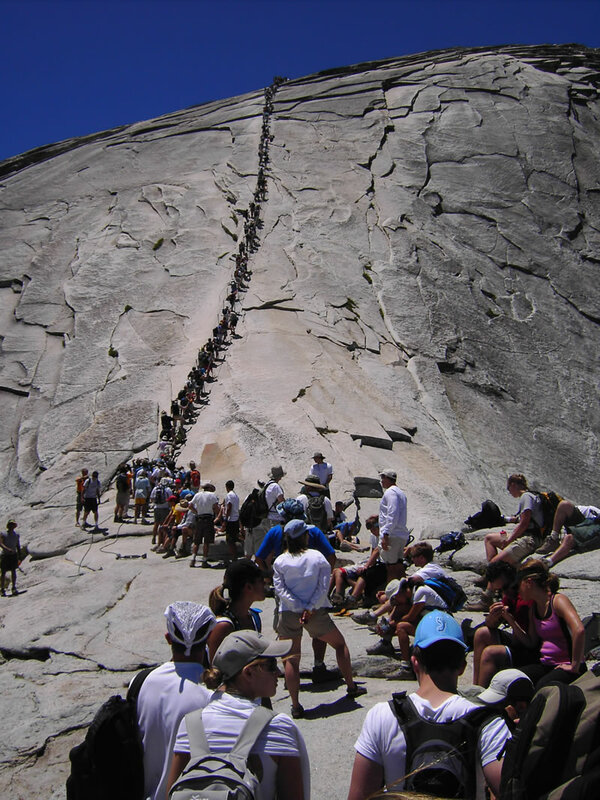 It's always crowded, and many tourists want to go into the mountains even though they are totally unprepared. It's prohibited to enter the lake Morskie Oko, yet we can see photos (just look below) of crowds sitting with their feet in the water and no one does a thing. Many of them are also too weak or lazy to do the trek, so they hire horse-drawn carriages even though it is well known the horses are poorly treated and often die of exhaustion. The money their owners make off tourists are much bigger than the price for another horse. I’m an introvert with severe social anxiety. The photos below are truly terrifying to me, I can’t get how anyone would think it’s fun! Recently, when I was planning my vacation in Norway, I was checking out what my options were in the southern part of the country. Naturally, the famous Preikestolen came up. For a few seconds, I considered doing the trek. But then I saw a pic of all the tourists waiting to take a photo on the famous ledge, and I almost got a panic attack. I chose random, not renowned, trails and enjoyed wonderfully tourist-free trails and unspoiled nature. And that's precisely what we can do. There are so many beautiful places out there - why keep on going to the same ones where they can't survive all the hikers? Why not discover less-known trails or go off-season? The trails and campsites need to time to recover. Spacing the load of hikers over long period of time takes off some of the burden on the land. But what if we really want to see a famous spot? Three years ago I was on the Isle of Skye. It was my first time in Scotland, and I was getting head over my feet in love with that land. Was it much of a surprise that I wanted to see the Old Man of Storr? It's probably the most popular spot on the island and quite understandably so - it's stunning and easily reachable from Portree by car or a bus. When I was there the first time, the weather was brilliant - sunny and dry. I could see multiple paths crisscrossing the area, but didn't think much of it. The next time I was there, I came from above after crossing the Trotternish Ridge in nasty wet weather. The top of the Old Man of Storr was covered in milky-white fog, and the paths were no more - they were more like multi-leveled fields of a muddy nightmare. The erosion was horrible as people tried to avoid the mud, creating more paths. With each rainfall the trails were getting more muddy and harder to cross, so people kept walking around them in ever-farther arches. It really showed well the consequences of mass visits by people who were not prepared for the challenge. When you hike in boots, you don't care you get muddy - you can stick to the trail. But it's quite understandable that when people go up the mountain in loafers and sandals, they try to avoid getting dirty, adding their part to the growing erosion. We see the same problem on many other trails: when there is a muddy spot, people go around it. Sometimes they make multiple new paths and even break branches, damage the plants around to get through with dry shoes. Sometimes there is no sense to go through - I also wouldn't want to get into a puddle that is above my boots. But when it's just a bit muddy and the moisture wouldn't flow over my boot? No problem. So what can we do? Let's discover less known places, which might be as beautiful as the well-known landmarks. If we wish to see the famous spots - let's go off-season or on unpopular dates, avoiding long weekends, holidays, etc. If the only time we can see our dream destination is during its popularity peak - let's try to stick to the trails, keep all the rules of Leave No Trace, be prepared, and never cause additional damage. If it’s possible to reach the place by public transportation - do it. People who come by cars leave them sometimes in wrong places because the parking spots are filled to their capacities. They park by the road and on any flat area they find - often damaging fields. Take a look below at some examples of apparel and gear from eco-conscious brands. 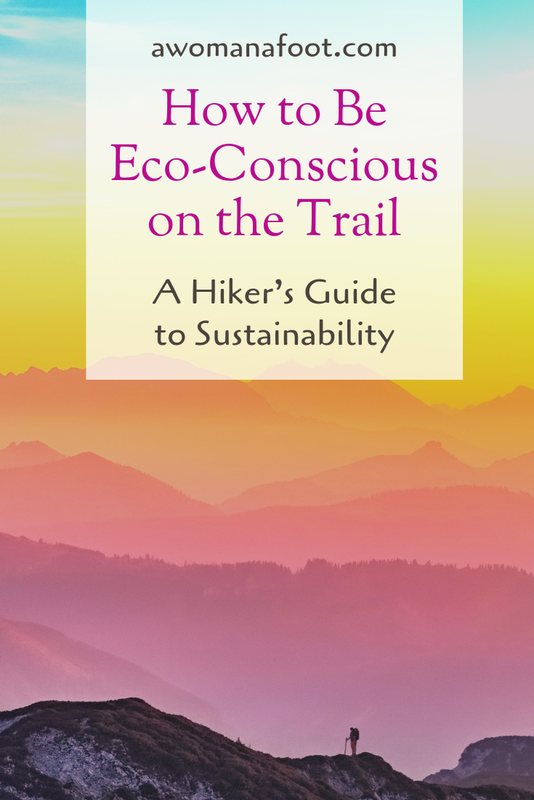 Eco-Conscious on the Trail: Go local & Support local! We all know that transport emissions are a big part of the global ecological problem. It really doesn’t matter we use our own legs to move when we hike if we flew across the world to get to the trail head. The best way to cut on carbon emissions is to hike local. Going by train or bus to hike in local mountains is probably the best way to limit harmful emissions. If the only way to get to a trail head is to use a car - we can check if maybe more people want to go on the same day - local hiking forums could be really helpful. As you can see in my blog I do fly to hike quite often. I am guilty of adding more carbon to the atmosphere. To minimize the impact, I try to use direct flights whenever I can and then use public transport to reach the desired designation. I don’t have a car (I don’t even have a driving license) so I’m a big fan of public transport. I am truly happy when I can reach the starting point by train or bus. I plan my hiking trips accordingly - I had to skip some trails simply because there was no way to get there without a car. If you plan on going away from home - think about ways to support local population. Their needs are always ahead of the needs of tourists. I know it often depends on one’s budget, but it is worth supporting the local economy which often depends on tourists. By buying food in local restaurants and pubs, buying groceries or lodging, we help locals get something back. If you travel to countries on the Southern Hemisphere, you might consider hiring local guides - it makes your trip safer and provides support for local economy. Depending on where you live and what your life is like, you can choose different ways to support the fight for cleaner Planet. If you like to hike in a particular park, you may want to check if they need volunteers to help with the upkeep or if they accept donations. Find organizations and charities that support conservation efforts - either related to your hiking destinations or general. Many National Parks are able to function only thanks to a big number of dedicated volunteers who help with repairing trails, collecting garbage or fixing damages. It’s also worth thinking about those, who are not privileged to have an easy access to the Great Outdoors. Research organization who help get kids from impoverished neighborhoods or Vets into the mountains. Some of them might want to accept donations of gear you don’t need anymore. I know I’m far from zero-waste or zero-carbon footprint, but I hope to get closer to it as much as I can. I’m working on getting better at being eco-conscious. What are you own ways to minimize the negative impact on the environment? 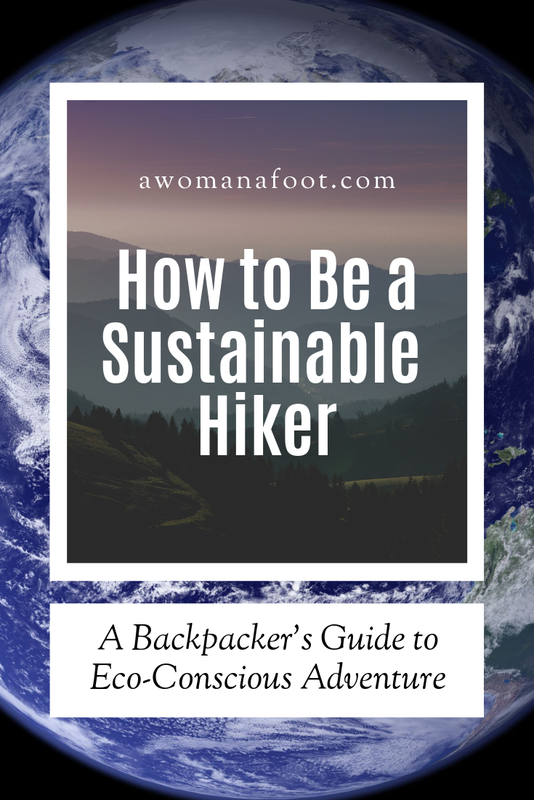 Have you done any major changes to the way you hike/buy gear/clothing that you consider eco-friendly? What do you see as the biggest problem ecology-wise in the hiker community?